I feel like Labyrinth is trying to mind game his opponent and is planning some all-in. It seems so many faces I haven't paid attention to for a while are becoming dolled up, as these boys must feel a lot of competition to be good looking or something. Byun in particular seems different. Flash vs Ryung next round is such a cool match up. Im shocked that Mvp lost. Ive gotta check the game out when i return from work. Gratz to all who progressed! I guess we'll find out if it becomes a trend when the next recipients get it. Should be MKP, DRG, and Leenock in 2 seasons, I think. Also, soO's interview please ) Thanks Seeker! (._.) ( l: ) ( .-. ) ( :l ) (._.) They see me rolling. They hating. What's with all Labyrinth love lately? Bow down to the sons of Aiur...SKT1_Rain, CreatorPrime, ST_Parting, Liquid_Hero. They should play Earthquake whenever he enters the booth. Good Guy HyuN makes sure his younger teammate gets a team. Totally agree with Effort there. Very deep. I made an attempt at translating Effort's interview. My Korean is very very low level, so take this as one step above (or maybe below!) google translate. You advanced to the second round of Code A. How do you feel? I fell out in round 1 last Code A. But this season I passed round 1 so I feel good. Usually I'm close with ByuL so feel sorry for ending the game so quickly. You won the first game easily with a Zerg rush. ByuL's preperation had many... (limitations?). I saw the first map was good for speedlings. ByuL's build started the same but I made more lings so my poke was more successful, and after that our builds diverged and I was able to win. The second game ended quickly also. Since we scouted each other, I expected ByuL to safely secure (앞마당? front yard? expansion maybe?). So due to ByuL following his prepared action, this was the result. Even during the game it was sad. It was very futile, so the game ended. Your 2nd round opponent is Lure. Are you confident? I'm sorry Lure, but originally I expected Jaedong to advance. It's unexpected. Beating someone like Jeadong is remarkable, so I won't be careless and I'll have to prepare thoroughly. Proleague is going at the same time, isn't preparing difficult? I think it's difficult for every Kespa player. If we try hard, there will be good results so even if it's difficult we must prepare hard. You secured a spot in next season's Code A. What is your goal for this season? My goals are getting bigger. Because still haven't stepped onto the Code S stage, that's my goal. If I make it to Code S, I'll think about the next goal. Proleague doesn't use some of these maps, isn't preparing difficult? There are 2 maps the Proleague doesn't use, so before the match I was worried. But because I could watch ByuL's ZvZ, even without much time I had enough practice. ETA soO's interview also. Again my skill is bad, I tried to mark some of the parts I was most confused by with ??s. First what are you thoughts about winning? I was able to beat a very famous Star2 player, so I'm honored and happy. Your opponent was the player with the most GSL championships, MVP. I didn't have much time to practice. Because of Proleague I couldn't practice much, so I mostly thought about the game. Because of that I was able to win. In the 1st set you easily blocked the Hellions, later entered a lot. For this game I found there is no doubt that blocking well (??) is a method to victory. So for attack timing if you make Broodlords I think you can win. In the 2nd set you prepared a roach attack. Did the match Nestea showed influence this? Your next opponent is Killer. How do you think the match will be? I haven't looked at Killer's matches. I still haven't figured out the skills [for SC2?] so it's hard, but I think it will be an interesting match. Today was your GSL debut. I really like the GOMTV booth. The one at Yongsan stadium is on the small side. I get a strong feeling that it's my own space. Next [GSL] season and Proleague round 4 will use HOTS. How do you plan to prepare and handle this? I've hardly looked at HOTS. I've heard Zerg is not very different. So it's enough to start when HOTS begins. (?) Talking with other players will be enough preperation. 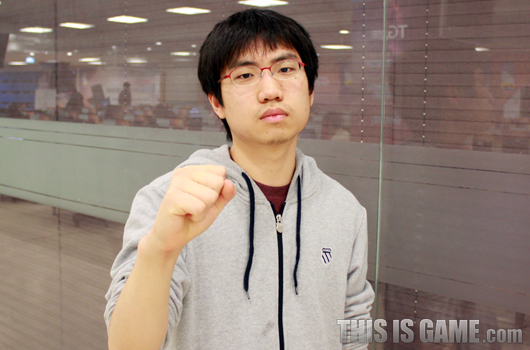 Recently many people are worried about Bisu. He's doing well, so don't worry. FanTaSy is also on a losing streak but I believe he will do well soon. Thank you Bisu for helping me, and also FanTaSy who always comes to the stadium and takes care of me. why do you not believe it? the legend has alived! Recently many people are worried about Bisu. He's doing well, so don't worry. Good to hear Thx for all interviews they all are very good. You made it to the second round of code A. How does that make you feel? In Set 1 your aggressive strategy won you the game. It helped that I prepared a lot. In the first game I played well. It's productive to practice the same build, and that's why I was victorious. The 2nd set ended really quickly. Both of us kept our overlords near the other's main base for scouting. However, my attack happened too quickly and I was able to rush for the victory. Lure is your opponent for the 2nd round. Your thoughts? I thought Lure would advance. It's unexpected that so many great players from Fnatic fell; it seems they were caught by suprise and need to prepare better. Don't you find it hard to prepare for both professional leagues? It's hard to believe how many tournaments are available for players. It's very hard to get a good performance when your opponent seems better prepared. That's why it's so difficult. With your victory you've secured a spot in Code A next season. What's your goal for this season? My goal is to secure a spot in Code S next season. I've not been able to step on the stage of Code S because I've failed to advance far enough to hold one. Today's maps are not being used in SPL. Were you concerned? The fact that two of the maps weren't being used had me worried. I didn't even have enough time to practice for them.